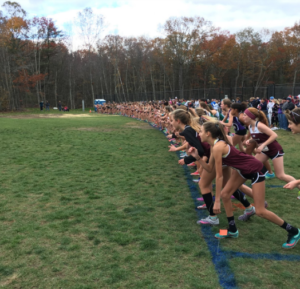 As the RIIL Indoor Track State Championships culminates the winter sports season on February 18 at the Providence Career and Technical Academy, we take a look back on the previous fall season’s cross country state championship—flashing back to before indoor track. On November 6, the six months of training that morphed each runner into the best physical shape possible—in order to run their fastest five kilometers on that day—was put to the test. The runners completed their warmups, and smiles and laughter were a rare sight. Unlike most sports, in cross country there is only one day that matters, there are no playoffs or “must win” meets beside the state championship. All 137 boys knew this. EG senior Jackson Cronin is pictured in the chase pack early in the race. The race started as expected, as two-time defending champion DJ Principe of La Salle created a huge gap on the rest of the field within the first 800 meters. At the one mile mark, the race had really opened up, and Principe clocked a 4:35 first mile, effectively making it a race for second place. 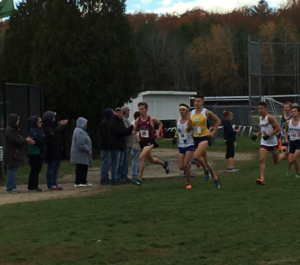 For the first half of the race, that spot belonged to Sam Toolin a standout sophomore from North Kingstown. However, a chase pack consisting of six runners—including East Greenwich’s own senior Jackson Cronin—was closing the gap that Toolin had build in the first mile. By the end of the second mile, it was no longer a pack race, and individuals began to separate from one another. Toolin had dropped back out of the top ten, and his fast start seemed to have caught up to him. Later in the race it became evident he seemed to be suffering from some form of injury or cramp. 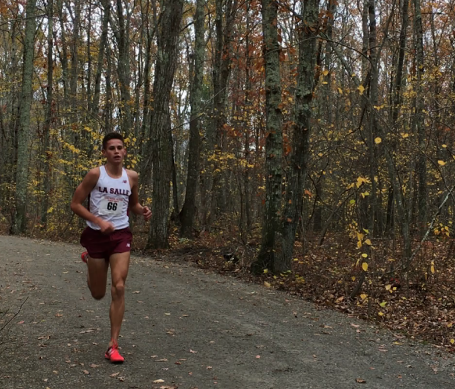 Instead, Mars Bishop of Barrington had taken over as the second best runner in the state, with freshman Max Dimuccio of La Salle and senior Ben Drezek of Cumberland in pursuit. These four, along with Joseph DosReis of Lasalle who out-kicked East Greenwich’s Cronin in the last 100 meters, and Kyle Keefe of Chariho earned the coveted first team all-state spots. Principe recently ran a 4:00.97 indoor mile, the third fastest high school indoor mile of all time. The story of the day was Principe’s record-setting time of 14:56.09 over 3.1 miles, shattering his time from last year by 13 seconds. 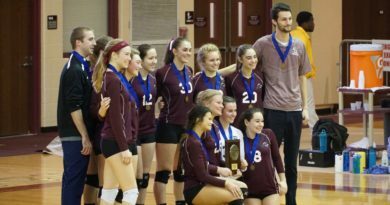 He led a dominate La Salle team to their third straight state championship. 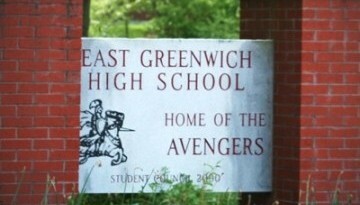 East Greenwich fared well, finishing fifth overall, qualifying for New England’s once again (where they placed fourth among RI schools, edging out Chariho, who beat EG at states). 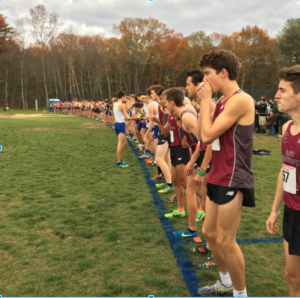 They were led by Jackson Cronin (16:16), with senior Willy Por (16:44), senior Jack Sommer (16:45), junior Cebastian Gentil (17:19), junior Colin Cianciolo (17:20), senior Hank Perretta (17:34), and junior Quentin Viera (17:53) making up the rest of the team. The girl’s race started the same, with East Greenwich closest to the spectators in box two. Within the first 100 meters, defending champion Ellie Lawler made her way up to the front, and did not look back. She put together a dominate performance, and successfully defended her title finishing with a time of 18:00.67. Being a junior, Lawler will have a chance to join DJ as three-time state champions next year. 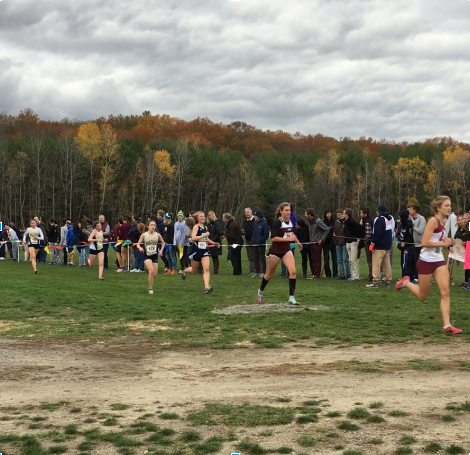 Randi Burr, a junior from Westerly also ran very strong and was able to stay within striking distance of Lawler, finishing with a time of 18:12. It was an exciting race down to the end, and a very competitive race for third. At the two mile mark, sophomore Elizabeth Sullivan was running well in third place but was passed by junior Grace Connolly of La Salle in the last mile, and junior Emily Kane of La Salle in the last few meters. Shayna Cousineau, a senior from Cranston East, and Alyson Walsh, a senior of La Salle rounded out first team all-state. The La Salle girls proved to dominate once again, and won their fourth straight title even after losing five runners to graduation last year. Kalie Bremer finishing without a left shoe. East Greenwich sophomore Kalie Bremer earned 16th, and second team all-state with a time of 20:01, all without a shoe. Within the first 100 meters, Kalie lost her shoe and had to run three miles with just one. This was especially difficult on the Ponaganset course, which was made of primary rocks, not the dirt that some courses consist of. However, she was able to lead the young Avenger team to a sixth place finish with the help of freshman Leah Chace (20:22), freshman Bryn Shunney (20:28), freshman Ana Caliri (20:57), sophomore Isabella Muratore (21:20), sophomore Alivia Saunders (21:26), and sophomore Emma Macdonald (21:32). La Salle continued their dominance in the cross country season. 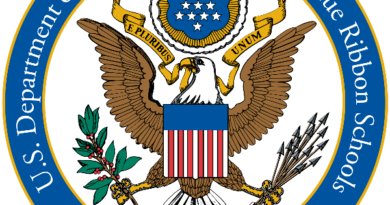 However—back to the present and future—on February 18, after all this snow melts, at the Providence Career and Technical Academy, East Greenwich will look to make their mark and perform well in their various events, giving some of the powerhouse schools a run for their money. Recently the boys won the Class C Championship and the girls placed second in the small schools class on February 4. Let’s hope they can carry over that success to February 18. See the full results from the RI Indoor Track Class Championships from February 4 here.